Ever see the movie “The St. Valentine’s Day Massacre” ? There is a scene at the funeral of one of the murdered mobsters where the camera focuses on a huge flower arrangement that says “From Al”… as in Al Capone – the guy who arranged the murders. Airline prices have “gone right back up in the air” with the grounding of REDjet, says Minister of Tourism Richard Sealy. And he has warned that the true potential of regional tourism, especially the event-based niche, will only be realised through viable travel options for those in the Caribbean. 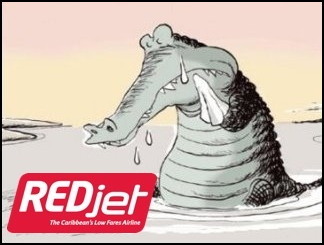 … Directly addressing REDjet airline’s suspension of flights since March 17, the minister said “… the cost of travel in this region is simply prohibitive. I am told that there are some discussions on with respect to other players and we may be able to get some specials around the Reggae Festival. Certainly the resources of the Barbados Tourism Authority will be working feverishly behind that effort. “Obviously, with the demise of REDjet, and the way the fares have gone right back up in the air, it is a big problem. I sincerely hope that once and for all we can come up with a meaningful, long-term resolution for that situation… I sincerely hope that something can be done to get REDjet back up in the air; and if in the unfortunate case REDjet flies no more, I would sincerely hope that another venture along those lines can come into reality very soon so that the consumers of Barbados, and the rest of the Caribbean can benefit,” Sealy stressed.